Here's a bright side in the Survey of Consumer Finances from 2013: Credit card debt levels are down and fewer families hold credit card debt. I got the figures from Table 13 out of the SCF historic tables. 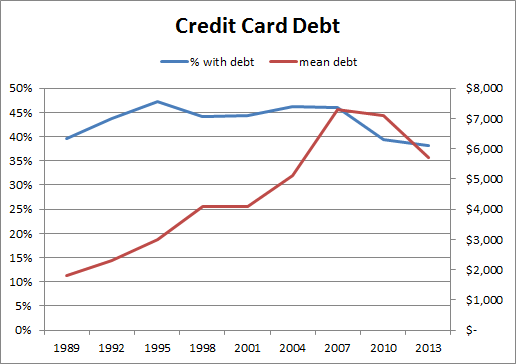 So in the 3 hears from 2010 to 2013 the average debt dropped $1400 and 1.3% fewer families have any credit card debts. Good job America.